VICE-PRESIDENT Kembo Mohadi yesterday allegedly attacked his estranged former wife using an axe to break doors and threatened to shoot her in a dispute over property. 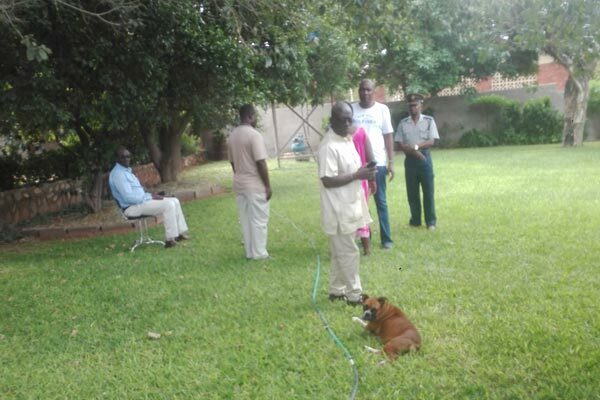 The enraged VP raided senator Tambudzani Mohadi’s Beitbridge home and grabbed three vehicles in full view of about 25 local police officers and his aides. Mohadi allegedly poked senator Mohadi with a deformed steel bar and threatened to kill her. However, later after fatigue apparently set in, retired to as chair after the hive of activity sapped his energy, according to some police officers who witnessed the incident. The officer commanding Beitbridge police district chief superintendent Tichaona Nyongo said he was not aware of the alleged attack since he was away in Chivhu. “I am off, I don’t know anything, I am in Chivhu,” Nyongo said when contacted for a comment. The officer-in-charge of Beitbridge police Chief Inspector Kenneth Mushongahande did not respond to calls on his mobile phone. But, a weary-looking Senator Mohadi confirmed the incident and said she did not know where to report. She did how to get to the police station after the VP left her grounded without a single vehicle. “I have just spoken to the Dispol [Nyongo] and he expects me to walk to Beitbridge police. My dignity has been heavily battered,” she said. “The police said I must go and report, but they were witnesses to what happened. They saw him commit this crime. He said he is a law unto himself. He was doing this on my defenceless person. I did not react. Police did not stop him. Mohadi allegedly seized all the three cars at his former wife’s home. “All the cars he took were awarded to me by the court at his instance,” Senator Mohadi said. “After his performance, which took a long time and seeing he was receiving no resistance from his wife he went to the patio where he pulled a bar stool and sat as he watched the vehicles being towed away,” said the source. Some of Mohadi’s nephews were present as he went on the rampage while police looked on helplessly. He moved out of their matrimonial home — 108 Impala Drive in Beitbridge — where his ex-wife lives and was the scene of the drama witnessed by many residents of Beitbridge’s low-density suburb from morning when it started. “We first saw many policemen arrive, then the VP’s fleet arrived,” said a resident who said they watched what was happening from outside the house. Earlier Mohadi forcibly closed Malins Transit he jointly operated with some businessmen and directed that all vehicles arriving from South Africa be taken to the old border post where he plans to operate another bonded warehouse.